This is an excellent expose of the unhealthy issues surrounding the captive lion breeding industry which is solely for hunting purposes. From cub petting, lion walking and the lion bone trade that will threaten wild lions in Africa. In Africa hundreds of lions cubs are bred for one thing only: to be petted by tourists and volunteers. This is their story. Produced by SPOTS in the Netherlands, helping us to bring awareness to the lions of Africa. The lid was blown off the canned lion hunting industry in 1997 when footage of a mother lioness being shot in a small enclosure in front of her cubs, was broadcast on the British current affairs programme, The Cook Report. But a recent video which emerged on YouTube from the Free State showed a similar scene of what appears to be a tame lioness being shot with a bow, in a small enclosure, off the back of a vehicle. This is breaking a number of laws. This incident begs the question: how much has changed in the captive lion breeding and hunting industry in the past sixteen years? We question whether the captive lion is being exploited right from birth to death and interrogate the ethics of hunting captive bred animals and whether this should be allowed. In this episode we investigate the so-called "green con", where volunteers are paying exorbitant amounts to come to South Africa to hand raise lion cubs under the impression that they are doing it for conservation. Activists allege that most of these cubs end up in a "canned" hunt or as breeding robots for farms. We focus on the lion bone trade which has grown hugely over the past few years. Many people know about how the rhino is being poached for its horn, which is used in traditional medicines in Asia, but few know that lion bones are also being used as a replacement for tiger bones in tiger bone wine in Asia, since the tiger numbers have plummeted so drastically. There are concerns that the trade, which is now just a by-product of the hunt, will eventually spill over into wild lion populations. This series interrogates the regulatory framework as far as this industry is concerned. Is the Lion in danger of becoming extinct? Some experts say that in twenty years the wild lion population has dropped by 80%. Today, only 2 800 lions are left in the wild in South Africa. However, the lion is only listed as vulnerable and not endangered, which affords them less protection. We thank 60 Minutes team of CBS News for their absorbing expose of the links between cub petting and canned hunting. Fifteen minutes of entertaining footage of Kevin Richardson with his lions followed by some profound exposure of the lies that lion farmers use to conceal their sordid, commercial activities. Elephant, Rhino and lion populations are being decimated across Africa. Habitat loss, poaching and other means of human-wildlife conflict have these species on the brink of extinction. At the current rate of decline, we could see these species disappear in the next 5-15 years. That is not our grandchildren's lifetime, that is OUR lifetime and thus OUR generation's responsibility. We must come together to speak out and take a stand to generate WORLDWIDE support for saving these species! Please donate to CACH so that we can help our lions to survive. 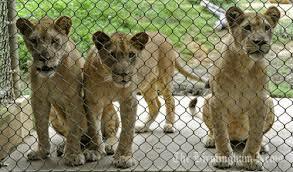 The most notorious of these 'wild animal factory farms' are those that breed predators -- in particular lions. It is heartbreaking to see young lion cubs wrenched away from their mothers because then the mothers come back into oestrus almost immediately -- resulting in another litter for the lion farmer. These lionesses are simply breeding machines to the men and women who own them and who stop at nothing to make that extra buck from mainly European and North American trophy hunters. 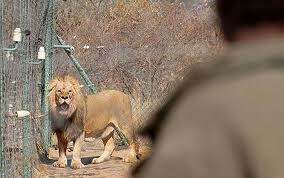 It is 'guestimated' that there are today 8 times more lions on breeding farms as there are in the wild in South Africa. And that is this country's 'dirty little secret'! Our wildlife heritage is being massacred by foreign hunters. We all need to stand tall to save Africa's lions.